It seems a tradition in the progression of most post-punk, experimental and/or No Wave-allegiant bands that they will eventually exchange their axe for a synthesizer, as if over the course of their creative development they just run out of guitar. Most recently shriek punkers Mi Ami went this route, as did garage revivalists Yeah Yeah Yeahs and indie rock band, Blonde Redhead. TV on the Radio’s 2008 release Dear Science stuck heavily to production and Radiohead is all too obvious an example of this with Kid A. I’m sure there are others, but even focusing on the annals of post-punk history, Wire eventually gravitated to an almost all-electric sound in the 80s and Joy Division, following the demise of Ian Curtis, were reborn the synthesizer heavy New Order. Speaking in Tongues by Talking Heads, Blondie, Devo. You can keep digging, of course: David Bowie’s post-Ziggy, Neu!-inspired work, Sabbath’s collaboration with Yes keyboardist Rick Wakeman, Kraftwerk and the evolution of hip-hop…etc. Eventually, like Dylan, many go electric, though, in the case of Liars, it would be more appropriate to say they went Suicide. Putting aside, though, my very random and less than concise examples of post-punk’s relationship with circuitry and technologically aided evolution, Liars have followed suit with their sixth album, WIXIW, which, if you haven’t heard already, is pronounced “wish you.” Following the relative paranoiac unease of their 2010 album Sisterworld, WIXIW cancels out much of their actual instrumentation, bleeps and percussive scraps dancing around in a sleek and arranged mutation of the sort of strange and dissonant music the band has been known to make. Singer, Angus Andrew, remains the band’s unifying element, his voice a throaty and serrated drone that drags across its shiny exterior. Sisterworld more than hinted at the transition WIXIW has committed. Grace and irregularity are mixed for the album’s opening track, The Exact Colour of Doubt. It’s difficult to hear this song without thinking of Radiohead’s Everything in its Right Place, Kid A’s opener matched for tempo and mood, its fields of tone spanning the entirety of the song, the subtlety of beat as translated through taps (or, claps in this case). It’s possible that, while Radiohead’s millennial masterpiece represented not only a musical adjustment for the band, and in some ways predicted the cultural shift as technology overtook most of our analog commonalities within the span of ten years, WIXIW expands on Kid A’s idea, but with a more jagged, frustrated disposition. Many critics will, if they haven’t already, cite Radiohead when discussing this album, so it might be a tired observation. You can declare with certainty that, if Liars were truly inspired to create their own Kid A, WIXIW would have to be less of a Liars album. It’s a tough sell to consider this album a bold move creatively when it so clearly operates within the same set of standards that Liars pursues with every release, most specifically their nerve-inducing repetition and intensity. Octagon is a pulsating and eerily crooned creep-oid and, though, No. 1 Against The Rush might be the most accessible song I’ve heard Liars commit to a recording, its streamlined chug and ear friendly synthesizer accenting one of Andrew’s cleaner vocals, you still hear anxiety. The title track is delivered in relentless waves of electric dissonance, an unsettling and corrupted mix of tone and unbalance. Flood to Flood builds upon repetition, combining layers of instrumentation as they’re introduced, thickening the main construct which become most noticeable after the music stops and starts again. This is not of course to say that WIXIW is “less than” by any stretch, the band’s language still conscious of identity, still attentive to its ticker. The Beck-ish A Ring On Every Finger is almost sinfully catchy, sort of upbeat next to the following folk song, Ill Valley Prodigies, a single guitar picked overtop a loop of collaged sound. His and Mine Sensations employs guitars in a dance punk fashion, a maneuver most closely connected to the band’s previous work, though, Who is the Hunter reminds me a tad of some of what Liars performed for their 2006 concept album Drum’s Not Dead, the song’s fluttering taps and musical accentuations a less abrasive version. Brats stands out as WIXIW’s club track, the band in an almost joking embrace with party music’s clichés and Annual Moon Words closes the album pleasantly enough, a non-threatening folk rock tune replete with WIXIW’s modernity. 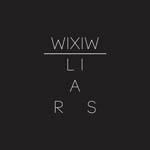 Though WIXIW will stand as a new musical direction for Liars, its presence of microchip’d sound shouldn’t suggest for the band any real progression. It’s a good album, revelatory in that Liars can carry their sound into different realms of possibility, a translation carried out by different instruments. They maintain their cred and remain on the fringe, but not because they went electric.